Come join New Forest Activities if you dare throughout half term week, Monday-Friday 25th – 29th October, from 18.00-20.00 to see what lurks in and around the Beaulieu River by darkness. Beaulieu is well known for its hauntings, with sightings of apparitions such as Monks and other unexplained phenomena. Maybe you will see Isabella, Countess of Beaulieu who died in 1786, and is often seen walking the area. You'll be guided by Canoe from your base at Baileys Hard, down along the Beaulieu River, exploring its mysterious creeks along the way, until you reach Bucklers Hard, the old Maritime Village. 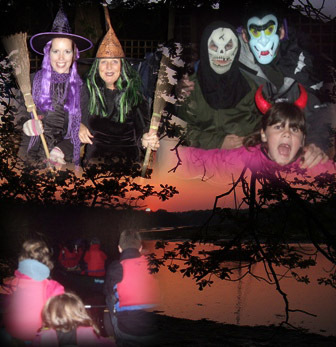 From Bucklers Hard you'll abandon your Canoes and head back to Baileys Hard on foot through the haunted woods alongside the river. Hold on to your loved ones! Guests are invited to come in fancy dress (Please be aware you will still need to put a buoyancy aid on), best dressed will win a prize! A drink of blood will be available to all guests on briefing (Mulled wine or Blackcurrant!). A torch or pumpkin is required, good footwear. A sense of fun and an open mind essential! Great for families and friends who are looking for a different way to enjoy Halloween! For more information and to book please visit http://www.newforestactivities.co.uk/ or call 01590 612377.